• The V&A has reopened its ‘Europe 1600-1815’ galleries to the public this week following a major £12.5 million refurbishment. 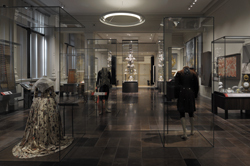 The seven transformed galleries, located close to the South Kensington museum’s grand entrance, tell the story of how France succeeded Italy as the “undisputed leader” of fashionable art and design in Europe in the late 17th century and how Europeans systematically “explored, exploited and collected” resources from Africa, Asia and the Americas. 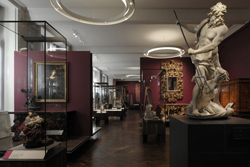 Featuring more than 1,100 objects, the galleries – redesigned in conjunction with architectural practice ZMMA – include four large rooms introducing the story of Europe across the period and three smaller rooms focusing on specific activities – ‘collecting in the Cabinet’, ‘enlightened thought in the Salon’, and ‘entertainment and glamour in the Masquerade’. Objects on display include a highly ornate Rococo writing cabinet made from Augustus III (on show for the first time since it has undergone a conservation work), a newly conserved 18th century bed from the Parisian workshop of George Jacob – furniture maker to Napoleon, a 17th century Venetian table by Lucio de Lucci and Pierre-Denis Martin’s oil painting, The Visit of Louis XIV to the Chateau de Juvisy (both on show for the first time) as well as several large recently cleaned tapestries including the 1860s Gobelins tapestry, The infant Moses tramples on Pharoah’s crown. 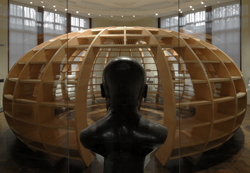 The display also includes three recreated period rooms – a 17th century French bedchamber, Madame de Sérilly’s cabinet and a mirrored room from 18th century Italy – while in the Salon can be found a contemporary installation, The Globe. A curved architectural sculpture, it is the creation of Havana-based artist collective Los Carpinteros and forms a “room within a room” within the ‘Salon’. It will be used for events and discussions. Entry to the galleries is free. For more, see www.vam.ac.uk/europegalleries. PICTURES: David Grandorge/©Victoria and Albert Museum, London. • On Now: A Victorian Obsession: The Pérez Simón collection. This exhibition at the Leighton House Museum – former home of artist Frederic, Lord Leighton – features more than 50 works by leading Victorian artists, some of which are rarely exhibited. The paintings, which include six works by Leighton himself as well as works by Dante Gabriel Rossetti, Edward Burne-Jones, John Everett Millais and John William Waterhouse, all form part of the collection of Mexican Juan Antonio Pérez Simón who has the largest private collection of Victorian art outside the UK. The highlight of the exhibition, however, is Lawrence Alma-Tadema’s The Roses of Heliogabalus, being shown in London for the first time since 1913. Admission charge applies. The exhibition at the property on the edge of Holland Park runs until 6th April. For more, see www.leightonhouse.co.uk. • On Now: Handel’s Performers. This display of portraits and documents in The Foundling Museum’s Handel Gallery is a showcase of celebrities and singers who brought the work of composer George Frideric Handel’s work to the public in the 18th century. Among those depicted are Anastasia Robinson and Senesino, among the highest paid singers of their time, Anna Maria Strada, a leading soprano, Gustavus Waltz, a bass singer who sang at the benefit performance of Handel’s Messiah at the Foundling Hospital in 1754, and John Hebden, who played in the orchestra during benefit performances of the Messiah in 1754 and 1758. Runs at the Bloomsbury museum until 1st May. Admission charge applies. For more, see www.foundlingmuseum.org.